Science and engineering (S&E) includes biological/agricultural sciences, physical sciences, computer sciences, mathematics/statistics, engineering, psychology, and social sciences. Physical sciences = chemistry, physics, astronomy, and earth/ocean/atmospheric sciences. All S&E degrees conferred include bachelor’s, master’s, and doctoral degrees. Advanced S&E degrees include master’s and doctoral degrees. Almost 184,000 advanced (master’s and doctoral degrees) degrees in S&E fields were awarded nationwide in 2011, 48% more than in 2001. Advanced degrees made up 25% of all S&E degrees (excluding associate’s degrees) conferred in 2011, a small increase over the 24% S&E share in 2001. Four states each produced more than 10,000 S&E advanced degrees in 2011, together accounting for 34% of all S&E advanced degrees conferred nationwide: California (23,415), New York (16,797), Texas (11,960), and Illinois (10,266). Advanced degrees represent 26–33% of all S&E degrees conferred in these states. 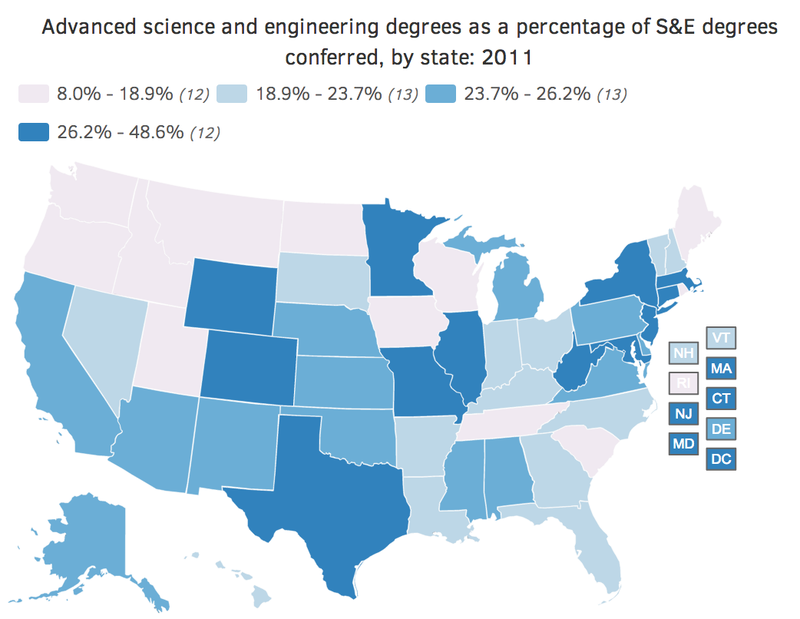 The share of S&E advanced degrees as a percentage of all S&E degrees conferred in 2011 ranged from 8% in Maine to 33% in Illinois.